← Food Trip Friday: Burgoo! My mother has late-onset diabetes. She acquired it because of eating too much sweets (chocolates and softdrinks) when they still had a small sari-sari store in their home in Cavite. I’ve seen how she suffered and how she’s still suffering because of this disease. She suffered a mild stroke in 2007 partly because of diabetes, and she underwent quadruple bypass surgery in June 2010 partly because of diabetes, too. This makes me avoid sugary foods. I told myself I’m not going to have diabetes just like my mom. It’s a good thing that I’m not really fond of sweets, but I like drinking coffee every once in a while, and most, if not all, of the time, I’d be using artificial sweeteners, which are quite expensive and unhealthy. That’s until I discovered Sweet & Fit, which is now available in selected supermarkets and drug stores nationwide. 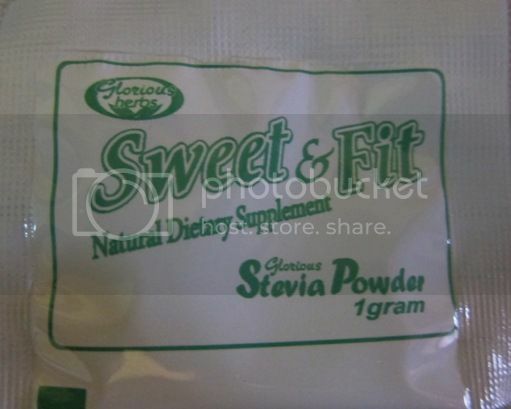 Sweet & Fit is a herbal dietary supplement that is ideal for diabetics, weight watchers and the health conscious. It has zero calorie, zero sodium, zero carbohydrate and zero cholesterol. 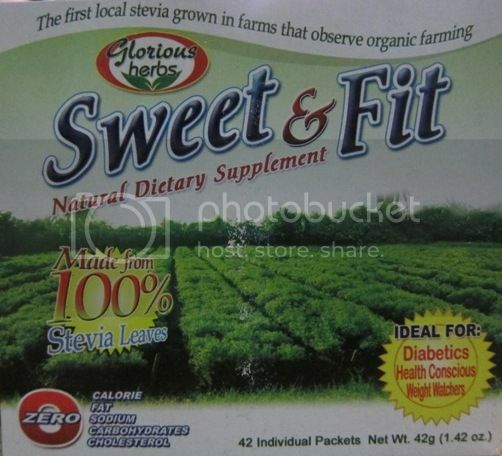 It is made from 100% Stevia leaves. Stevia Rebaudiana Bertoni is a small bush belonging to the sunflower family, which is now grown here in the Philippines. It is an excellent sugar replacement because it does not impact blood sugar levels the way white sugar does. Sweet & Fit is ideal for coffee and tea, cakes and pastries, cereals, salads, ice cream and meat and fish preparations. It’s also quite affordable; a box of 42 individual packets costs only Php119.75. Glorious Industrial and Development Corp. This entry was posted in Healthy Options, Natural Sweetener, Sweet & Fit. Bookmark the permalink. Thanks for taking the picture. It helped me confirm that this product is indeed available in the philippines. The other comment on this article is spam from a spammer and should be deleted.